To order click here! 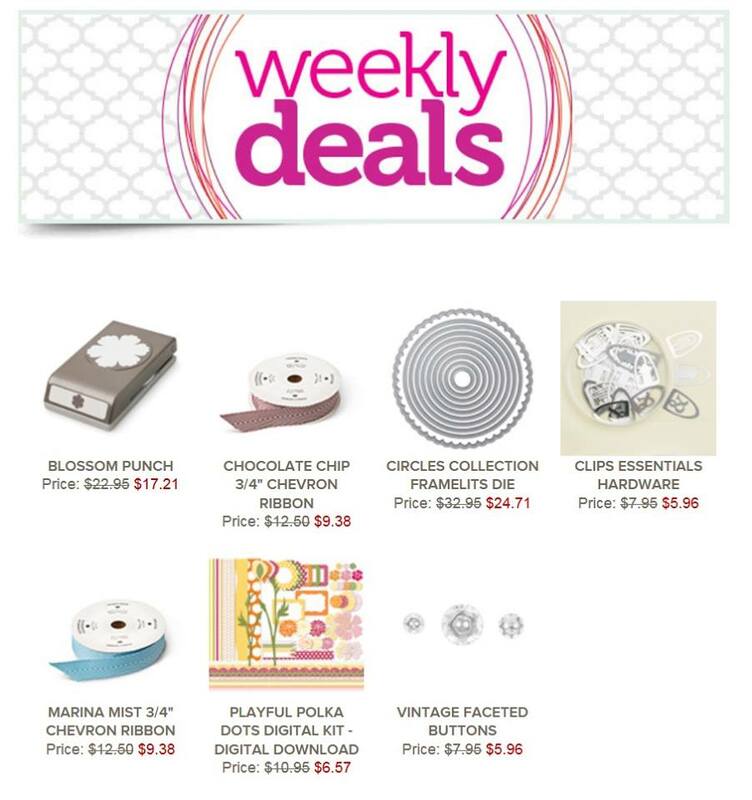 Don’t miss out on these great deals! The Blossom punch is one of my favorite punch! Click here to see many example of cards that I’ve made using it! 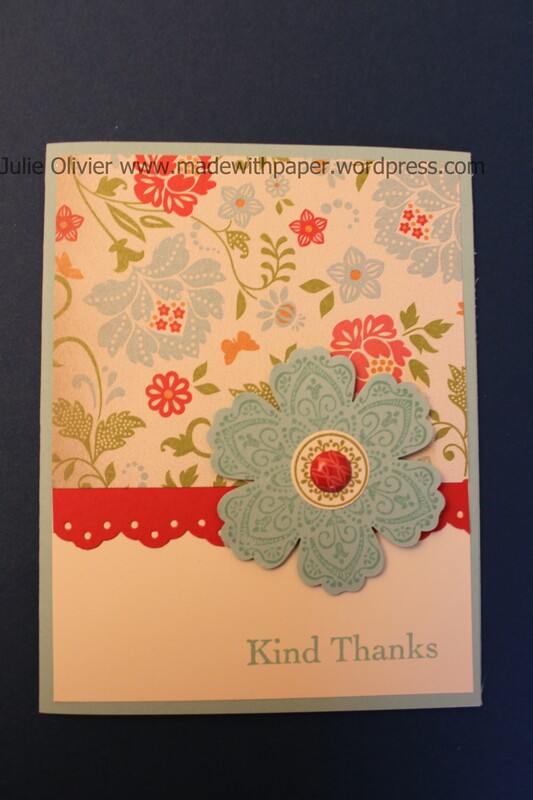 Here’s a card using the Blossom Punch (get it on sale this week only!!!). I also used the Moonlight Designer Series paper stack. The background is Smoky Slate and I used the new 2014-2016 In-Color called “Lost Lagoon”, to stamp my flower. I also used a strip of Lost Lagoon card stock, embossed with the Honeycomb embossing folder. Ink: Crush Curry, Smoky Slate, Lost Lagoon. I used the Fir tree stamp from the “Lovely as a Tree” set to make the “branches” at the top. 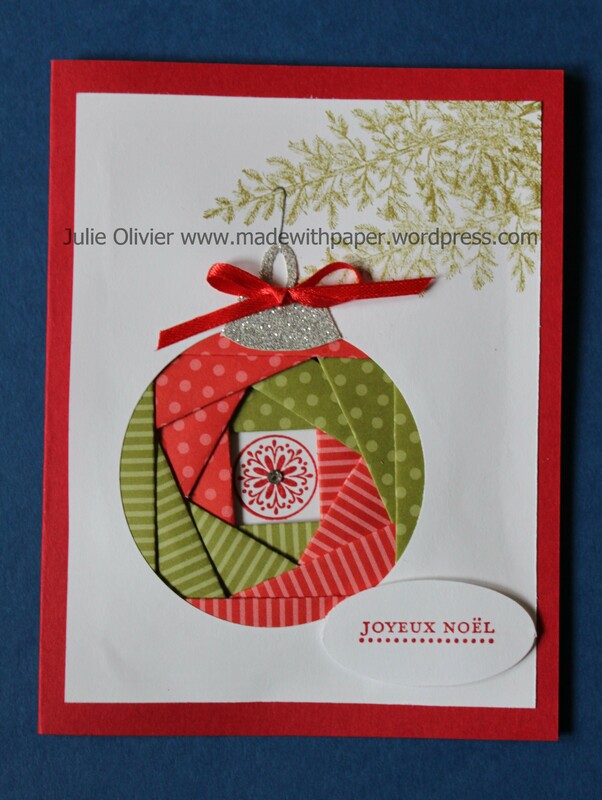 I cut the ornament with the 2-1/2″ Circle punch and then did the iris folding circle. For the middle, I stamped a little flower from “Mixed Bunch” set in Real Red and added a small rhinestone. I made the ornament “top part” (no idea how it’s called!) in Silver glitter paper, glued it in place and added a little bow with a glue dot. I drew a line (for the “hook”) with the Basic Gray marker. Ink: Real Red, Old Olive, Basic Gray Stampin’ marker. 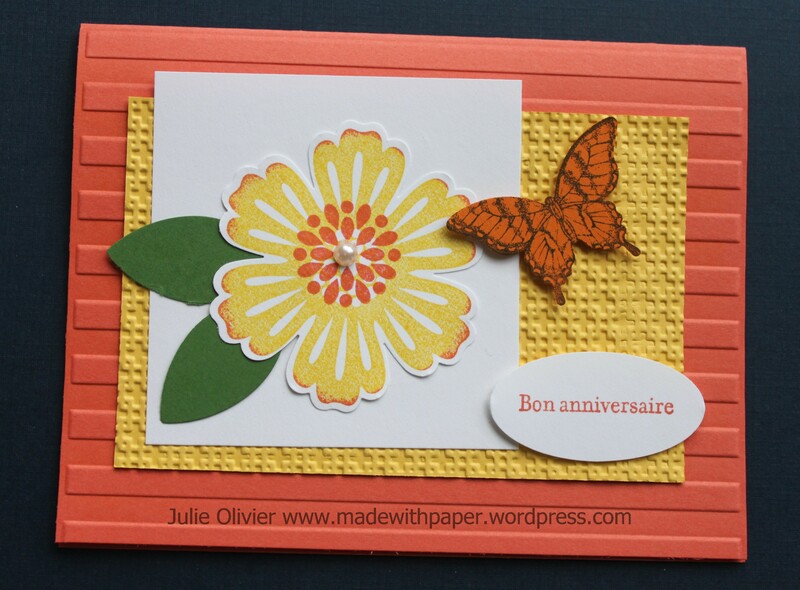 I’d like to share with you a card that I made that uses 2 of my favorite stamp sets: Mixed Bunch and Papillon Potpourri. The best part is that they each coordinate with their own punch: the Blossom punch and the Elegant Butterfly punch! Tomorrow, I’ll show you how you can easily step up that card, if you want to make it extra special!!! 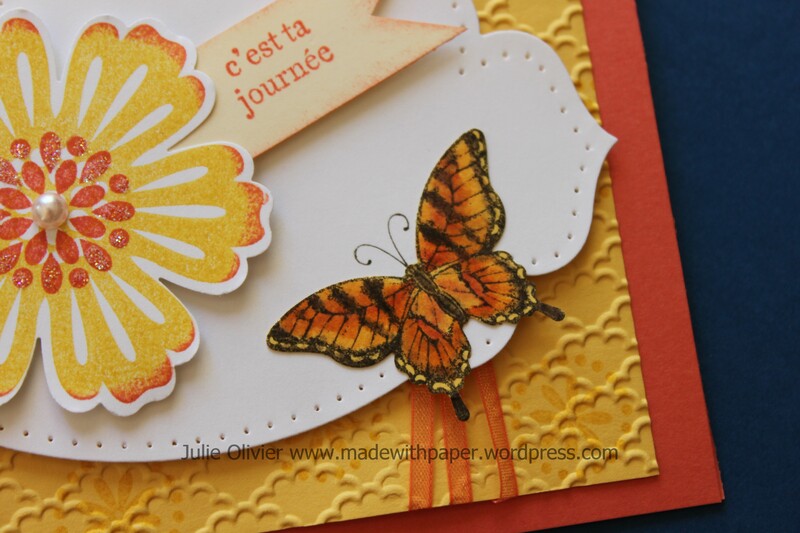 For the butterfly, I stamped the butterfly with Early Espresso ink on Pumpkin Pie card stock and used the Elegant Butterfly punch to cut it. 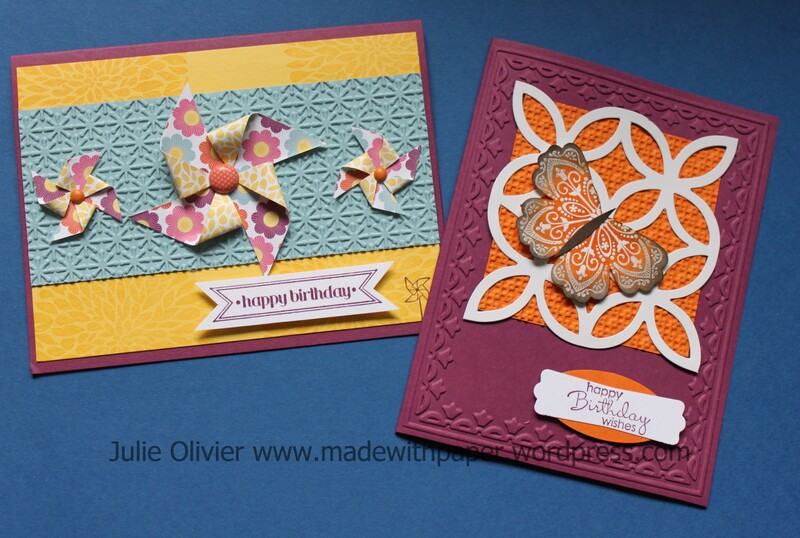 Some embossing folders for the background make a nice finish! 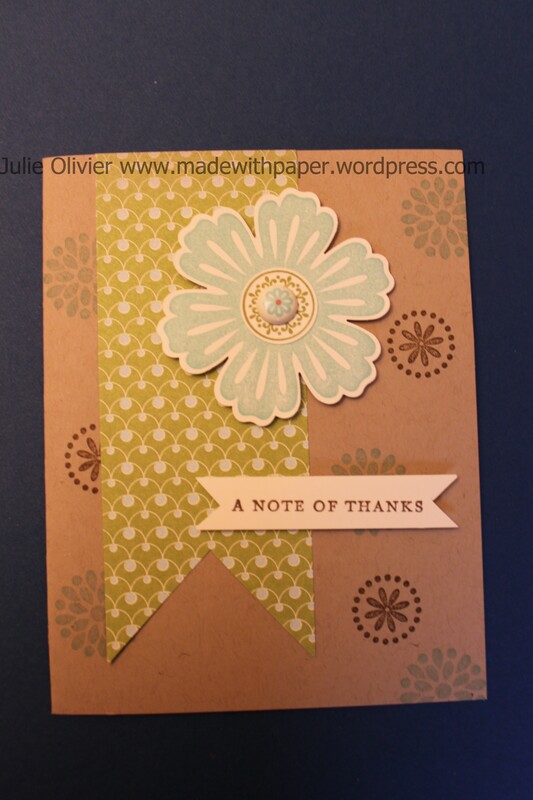 I used the Square Lattice and the Stripes embossing folders. 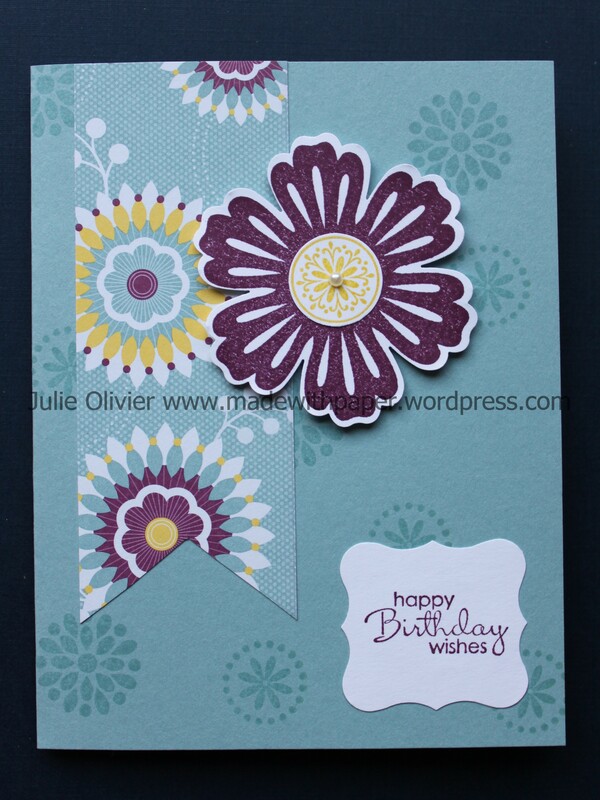 Here’s a simple card that uses the Mixed Bunch stamp set and the Blossom punch. These two were made to coordinate together and make your life easier! If you buy these two products together from myself during the month of August you save 15%. 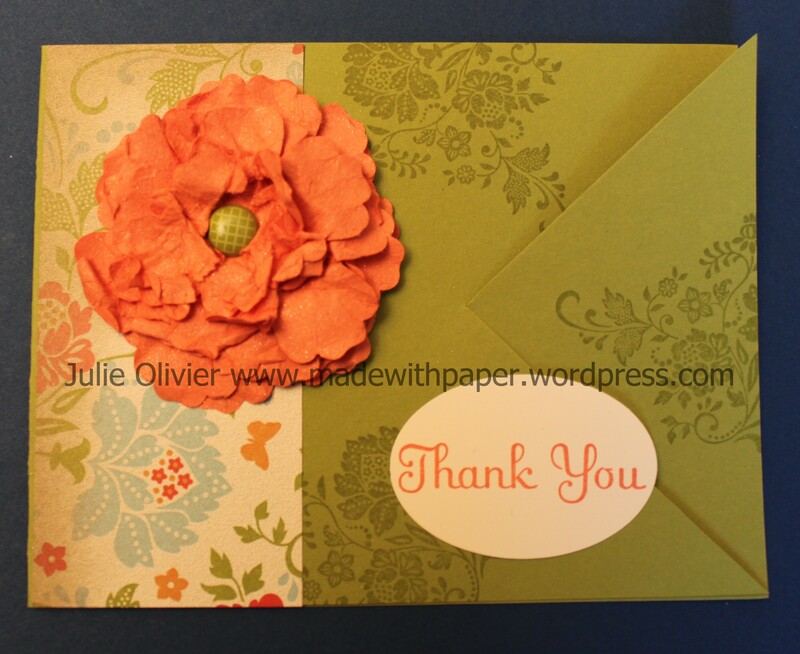 Mixed Bunch stamp set wood and Blossom punch reg. $56.90 **Now $48.37** plus taxes and shipping. Mixed Bunch stamp set clear and Blossom punch reg. $49.90 **Now $42.42** plus taxes and shipping. To make the card, I first stamped the background with two stamps from this set. I used a 2″ strip in Floral District Designer Series and cut it with scissors in a “V” shape. 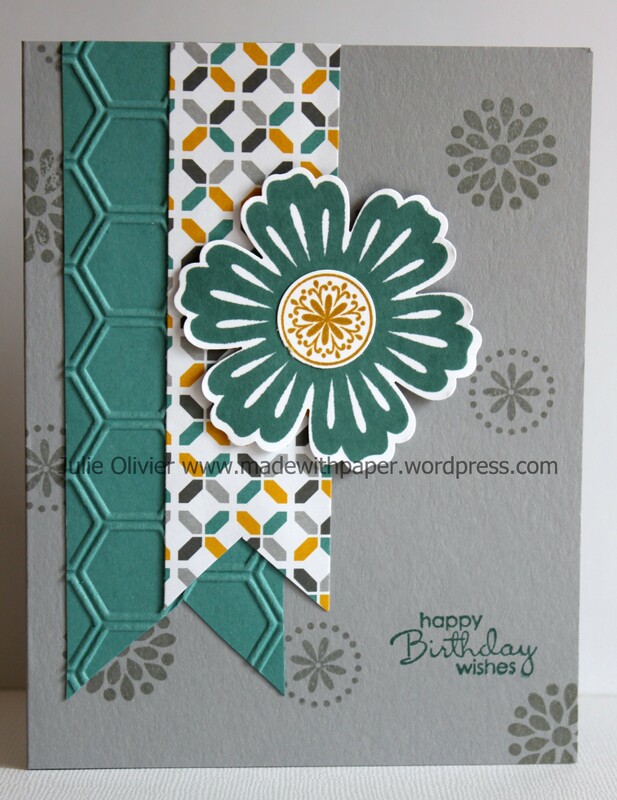 The flower was stamped in Rich Razzleberry and cut with the Blossom punch and then attached with Stampin’ dimensionals. The flower center was stamped in Daffodil Delight and a little pearl was added for a nice added touch. The greeting is from “Petite Pairs” stamp set. Punches: Blossom punch, Curly Label, 3/4″ Circle punch. 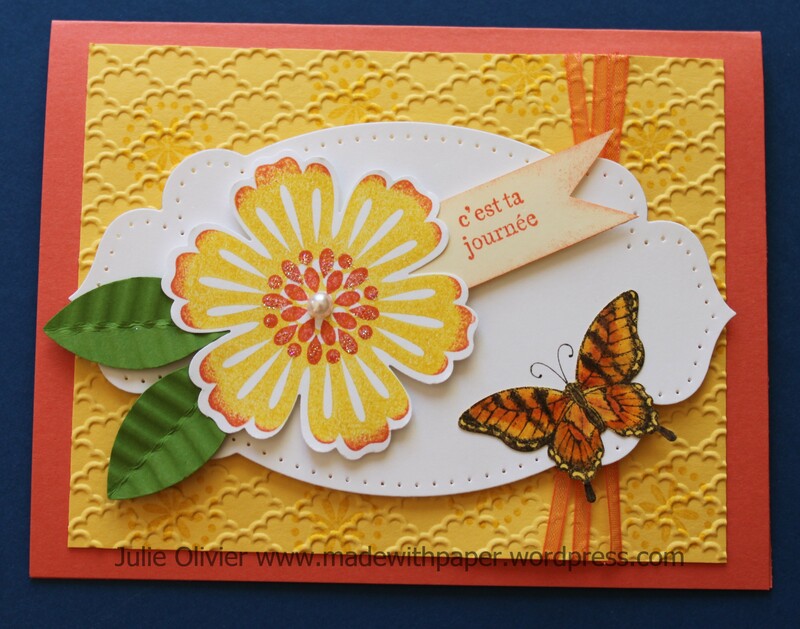 My next Monthly Card Class is coming up next Friday, June 22 at 7:00 pm. I still have spots available so let me know if you would like to join! We’ll be making 6 cards and this month, we are focusing on Birthday cards, but all cards are customizable for your own needs. Therefore, you can always pick the greeting that you like and that you want! Since the new catalogue just came out, I decided to do a “NEW CATALOGUE SALE!! !” So the shipping is on me!!! Enjoy free shipping on your order until June 24th. (***This equals to 10% off your purchase.) The cost for the class is $20 or a minimum $25 order. Here’ s a sneak peek of the class. 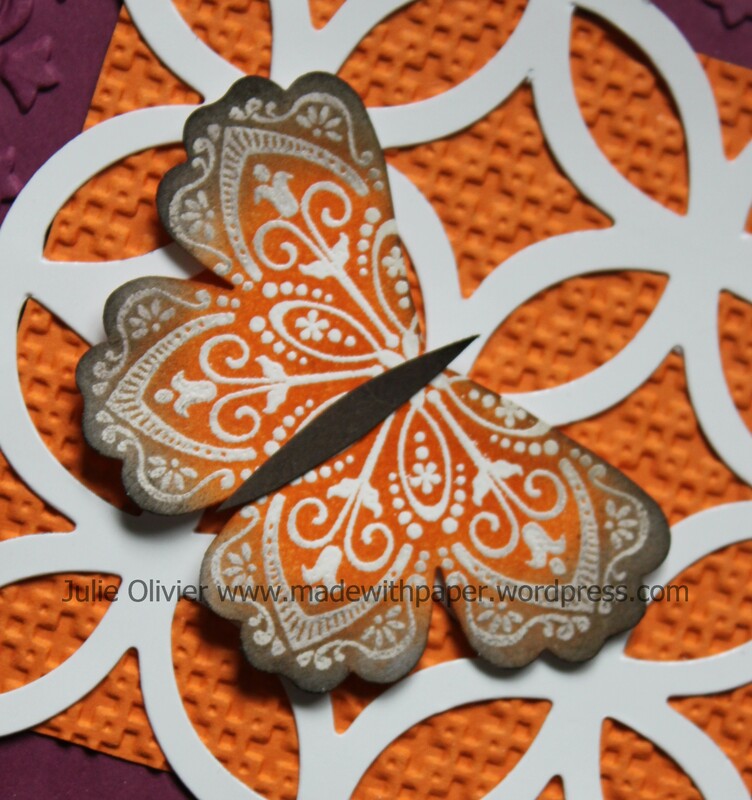 So if you want to learn how to make those pinwheels and how to do this beautiful embossed butterfly, please join me!!! I told you I would share some of the projects we made at my Team Meeting last Saturday. 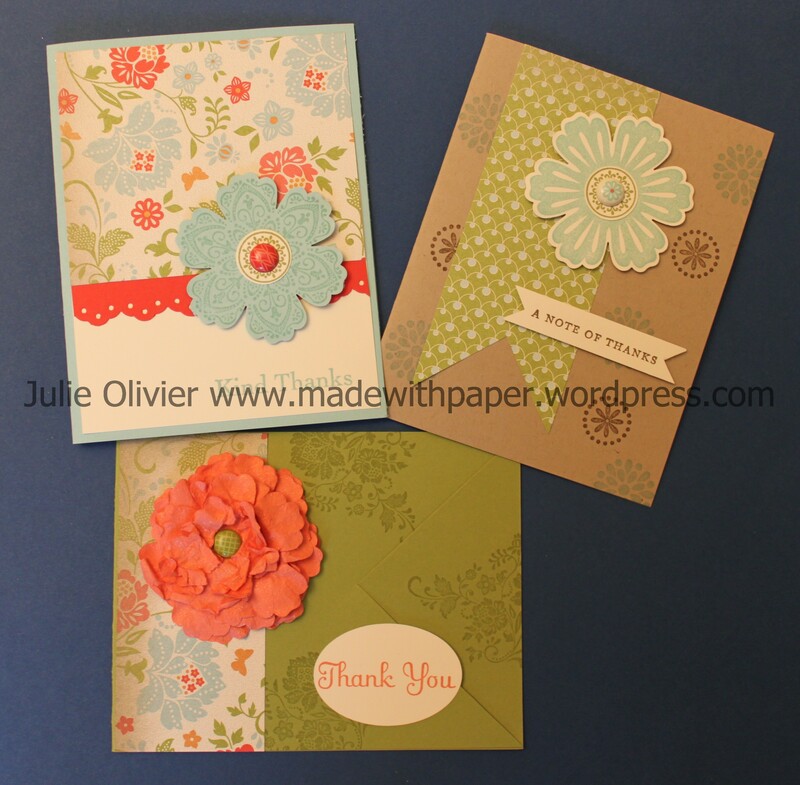 So here are 3 cards that we made, featuring the new Blossom Punch and the coordinating stamp set called “Mixed Bunch”. (Both from the Occasion mini-catalogue p.17). I love them both!!! We also used the Everyday Enchantement Designer Series Paper from the Sale-a-Bration products that you can get FOR FREE!! !